This month we welcome poet and author E. Kristin Anderson to our monthly Austin SCBWI member interview series. 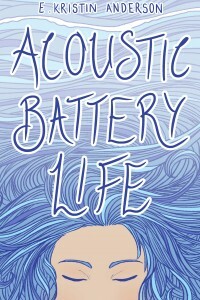 Anderson has her fingers in many writing pies, from poetry to chap books to anthologies. She is a huge advocate for other artists, she eats chocolate first thing after waking up, and she's got a drink at her local Starbucks named after her, so she's pretty much a superstar. We are so glad she joins us here. Where did you grow up, and did that place shape your work? If so, how? I grew up in Westbrook, Maine—a small town just outside of Portland. I think that I took a lot from the coastal vibe of Maine, and I often find myself writing about the ocean or water, whether it’s in novels or poetry. I also find myself attracted to setting my books in a small town. I think that the social dynamics are more palpable (for me, anyway) in a place where everyone knows everyone. Did you always want to be a writer, or did that come later? If someone were to follow you around for 24 hours, what would they see? I wake up super late. It’s embarrassing so I won’t tell you when. I will tell you that waking up usually involves at least one cat on my face. (I have dreamed that I couldn’t turn my garbage disposal off…and that was just my cat purring in my ear while I slept.) Then I usually eat something chocolate. After I get ready (this always involves some fabulous accessorizing), I usually go to my neighborhood Starbucks where I confuse the staff by not having a “regular” order. (Though there is a drink they call the Emily Special—my real name is Emily—which is a trenta Cool Lime Refresher with lemonade instead of water and one pump of peppermint.) I usually spend a few hours writing and/or working there. Editing things, answering emails, making new poems, or drafting a story. After Starbucks, I run errands, or perhaps spend some time with a friend. Time with friends sometimes involves going to the frozen banana stand, or perhaps to get cupcakes, or maybe a local poetry reading. (Hopefully there is food at the poetry reading.) In the evenings I tend to put on my pajamas as early as possible, bingewatch something (if not something new, I’ll go for an old favorite like The X-Files or Buffy or Quantum Leap), and write some more and catch up with friends in my online writing groups. How does your everyday life feed your work? A lot of my life lately revolves around some chronic illnesses, one of which I just found out about in December. So that has fed a lot of my recent work. I want to talk about health issues. I want to unpack my emotional baggage into something useful. I have a piece coming out in The American Journal of Nursing next year called “Between 50 and 64% of rats will self-administer diazepam.” It started with me freaking out because I wasn’t sure about medical interactions and it was three in the morning and I couldn’t call my doctor. 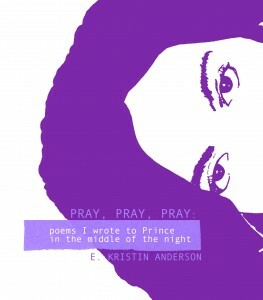 I also have an entire chapbook of poems I wrote to Prince (PRAY, PRAY, PRAY, from Porkbelly Press) because he was the place I went to during my darkest moments. (There’s also a B-side to this, 17 DAYS from ELJ Publications, which is a long poem in chapbook form.) I think my connection to music—which I’ve had since I was very young—tends to inform my work. In fact, you’ll see elements of pop culture in most of my work, poetry or prose. I also have found myself writing more political works recently, in part because I live in Texas, where women’s rights are often under fire. That element is so important, the more I interact with young people in my community. I want to see them have every opportunity to thrive. I want to be a voice that maybe makes a dent in some of the barriers they’ll have to face. Tell us about some of your accomplishments that make you proud (work and/or otherwise). I’m over the moon to be the editor of the forthcoming anthology, HYSTERIA: WRITING THE FEMALE BODY. The anthology includes work by 130 female and nonbinary writers, all creating work around the different experiences of being in a female or nonbinary body. 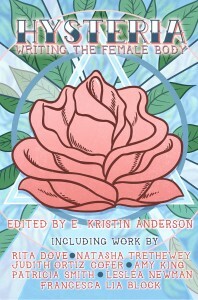 The anthology covers so many taboos, celebrations, traumas, and triumphs. And it includes work by some of our most celebrated writers, including Rita Dove, Francesca Lia Block, Judith Ortiz Cofer, Natasha Trethewey, Patricia Smith and Lesléa Newman. I still can’t believe I got to work with so many amazing artists to create this book. I also just sold my eighth chapbook to Hermeneutic Chaos Press. This book, WE’RE DOING WITCHCRAFT, is a collection of poems that center around feminist themes, growing up in a female body, about being a girl and a woman and the ways we can celebrate that while at the same time acknowledging the struggles that come with being a girl. I had begun to think that I was perhaps a “gimmick” poet, as I practice found poetry, and many of my recent works are found poetry and/or pop culture poetry, and I was worried that I had become pigeonholed in the industry. But Shinjini Bhattacharjee, the amazing editor at Hermeneutic Chaos, has embraced my work. I’m thrilled. What surprises you about the creative life? I think I’m getting to the point where nothing surprises me anymore! But ask me in ten years and I might tell you I was wrong. I think the only true surprises are the inklings that pop into my head in the middle of the night, which lead to me sending myself emails. Sometimes I think I’ve had a brilliant idea or come up with a beautiful line. Reading the email in the morning sometimes reveals that I was an idiot. But, sometimes, there’s something there and I get to writing. Your work is like a gift for your readers. When they open it, what do you hope they find? I hope my readers find something that reflects their truths. Even if it wasn’t my intent. I, to some degree, believe in the death of the author. I believe that what my poem or my story means to me isn’t as relevant as what it means to my reader. Kids on school visits ask me all the time “what does your poem mean?” or “did you really see a UFO?” And I can tell them what I think it means, or that I haven’t seen a UFO. But is that anywhere near as cool or truthful as what might make them feel good when they read a poem? I think this is actually one of the big misconceptions about poetry—that you have to “get it.” If you don’t “get” a poem, maybe it’s not for you. Or maybe what you think about it is different from what someone else says it means. But what you take away from something you read is just as valid and important as what the writer intended, or what your peers have to say about the work. 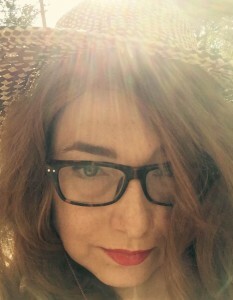 Author Bio: E. Kristin Anderson is a multi-Pushcart-nominated poet and author, and a graduate of Connecticut College. She is the co-editor of DEAR TEEN ME, an anthology based on the popular website and her next anthology, HYSTERIA: WRITING THE FEMALE BODY, is forthcoming from Sable Books. She is currently curating COME AS YOU ARE, an anthology of writing on 90s pop culture for ELJ Publications. Her poetry has been published worldwide in many magazines and anthologies and she is the author of eight chapbooks. Kristin recently took a position as Special Projects Manager for ELJ and is a poetry editor at Found Poetry Review. Once upon a time she worked at The New Yorker. She now lives in Austin, TX where she works as a freelance editor and is trying to trick someone into publishing her full-length collection of erasure poems based on women’s and teen magazines. 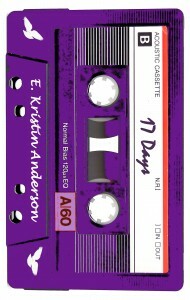 She blogs at EKristinAnderson.com and tweets at @ek_anderson.